An adventurous tale that explores the secrets of interdimensional travel, the Tarot, and the Merkaba. In the year 1896, a young woman finds herself standing in the river, not remembering where she came from or who she is. The only link to her past is a bag containing a few symbolic objects, including the Tarot cards. Followed by a cloaked figure, she ends up in Prague’s Jewish Town, which she recognises as an alternate version of her home. With the help of her new friends and occasional flashbacks, she begins to unravel her past connection to esotery, magic and places that initially seem unreal. One day, she meets a young man whom she recognises as her best friend. 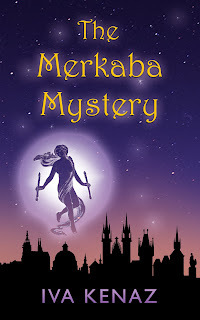 Through their mutual memories, she discovers that her origins are stranger than she thought and that one of the first words she recalled, Merkaba, is the true key to her past and future. The story is inspired by the author's esoteric background and hometown Prague whose name means threshold. The idea of Prague being a threshold to other realms had been explored in various works in the past, especially in Gustav Meyrink's Golem, which influenced this novel as well. Each chapter is symbolically and archetypically aligned with one of the Major Arcana trumps. 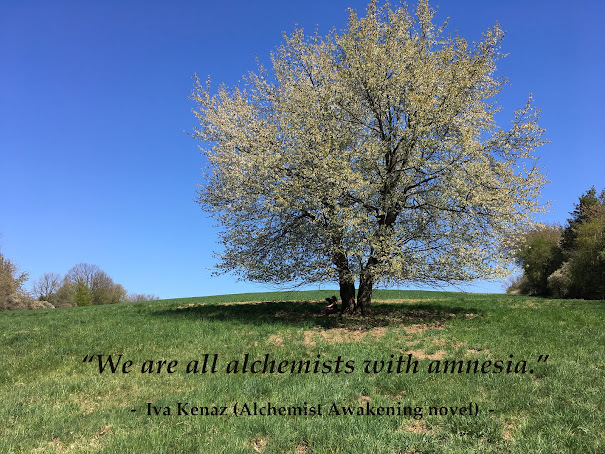 The novel is inspired by Prague’s legends and history, and explores the secrets of the Tarot, Tree of Life, and Merkaba. Each chapter is symbolically and archetypically aligned with one of the Major Arcana trumps. It all began with a dream in which I ambled across an unfamiliar looking Prague, watching as buildings were being torn down. I felt a strong bond with one of the houses and begged the workers not to demolish it, claiming that it was my home. After I woke up, I researched some old paintings and photographs, wondering whether I would find the street I dreamt about. Finally, I did. It was the Narrow Lane, located in the old Jewish Town, also called Josefov or the Fifth District, in Prague. From that point on, I had similar and even more vivid dreams of places, which I later found on old maps and paintings. It all seemed to be linked to a Prague before its fatal renovation, which happened between the years 1896 and 1903 and mainly affected the Jewish Town. I found this an interesting historical period, when the old ways met the new, and technical developments were taking over the world. I felt inspired to write a novel set at the turn of the century in Prague, but didn’t quite have a story. Around that time, I began to have even more intense and regular dreams about a Prague which looked more beautiful and colourful than the one I knew. It was a fantasy version of the city. I found it curious, since according to legend, Prague is a threshold to other realms. In fact, Prague’s local name Praha is derived from the word práh, which translates as threshold. Gustav Meyrink, a visionary author who described Prague’s renovation in his novel Golem, wrote that he felt as though the city truly was a threshold to other realms. He also spoke about a group called ‘Seven Brothers’ which supposedly established towns on inter-dimensional thresholds, and that the members came from Allahabad, India. Allahabad used to be called Prayaga or Prayag, which bears a definite similarity to Praha or Prague, and means meeting place or place of the confluences in Hindi. The city was built on a convolution of three rivers, but who knows whether there was a deeper meaning to that title. In regard to the legend, Meyrink also mentioned a mysterious Masonic lodge, the Sat Bhai. Curiously, the name translates to ‘seven brothers’ in Hindi, and in one of their texts, Prague is referred to as Pryaya. Before I began writing a story inspired by the above-mentioned dreams and legends, I studied various philosophies on spirit travel or the threshold passing. I also delved into teachings such as the Kabbalah and Sacred Geometry, and became intrigued by the idea of the Merkaba - the divine chariot or throne from Ezekiel’s vision in the Bible, also called the light body. One day, my spirit guide Gabriel suggested that I based the text on the Tarot’s Major Arcana. He considered the trumps to be the secret keys to the Merkaba, and said that their symbolism was naturally present in most stories anyway. I was intrigued, and divided the novel into twenty-two chapters, based on the Tarot archetypes, starting with zero, the Fool. It seemed so natural and fitting in every way, that I simply couldn’t resist the idea of including it. As I began to write with the Tarot’s Major Arcana symbolism in mind, I came to understand the correlations between the Merkaba, the Tarot, and the Tree of Life. This book therefore blends fiction with research and contemplation on these esoteric themes, which remain utterly fascinating to me. "This is a beautifully written book that opens up areas of Eastern European magic and fables that are often overlooked. This really is Kenaz; forte as I have discovered in her other books. This is an author that should be read and if you are a fan of mysticism and magic, you will love this book. I did and I happily award it five stars." "Take parallel worlds, ancient magic, secret societies with doubtful goals, old Jewish texts that conceal veiled answers to eternal questions, and you get yourself a wonderfully written story which will stay with you even after the last page is turned." "Although the Merkaba Mystery is never quite explained, a person must discover this for themselves, there follows a lot of adventures surrounded by magic, the Merkaba machines, and the trump cards of a tarot deck. Every turn is filled with the emblems of old world magic, metaphysic possibilities, and the proof angels are here to help us, which is my favorite part."